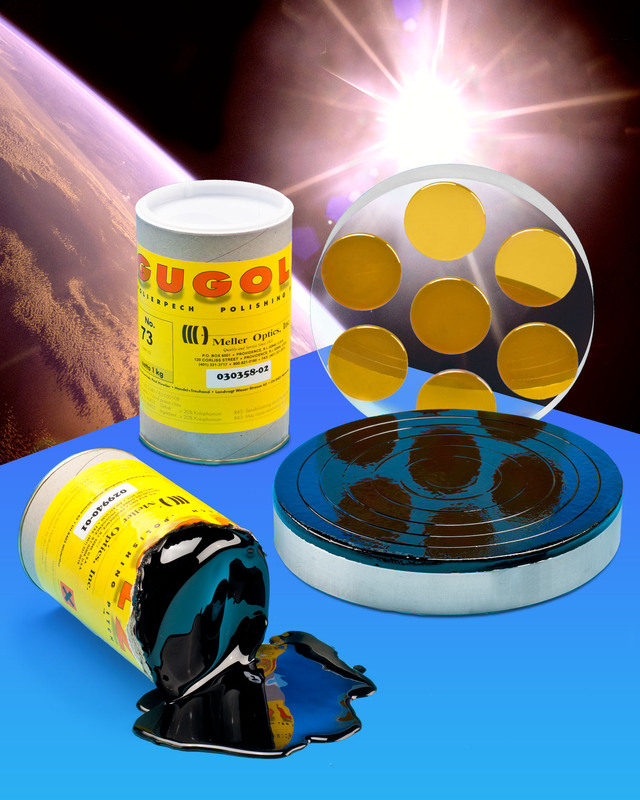 A line of petroleum-free polishing pitch made from all natural wood resin that comes in five easy to mix grades for hard to soft optics including ZnSe and ZnS is available from Meller Optics, Inc. of Providence, RI. Gugolz Polishing Pitch is made from all-natural wood resin rather than petroleum byproducts and comes in five grades from very-soft to very-hard that can be sliced, melted, and poured onto a lap. Offering melting points from 52°C to 87°C, this pitch carries abrasives very well and presents them efficiently which results in creating a superior surface finish. Ideally suited for polishing ZnSe and ZnS, Gugolz Polishing Pitch is effective for all hard to soft optics. Easy to use by slicing, melting, and pouring it onto a lap, this pitch eliminates the need for screening, filtering, or mixing additives. All hardness grades are fully compatible and consistent to let users achieve their own grade of hardness.